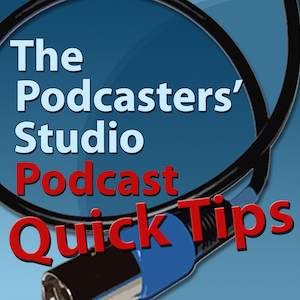 There are many factors that can lead to a final decision regarding your podcast file. Here are a few factors that I take into consideration when compressing my .mp3 for release into the RSS feed. 1. How good do I want it to sound? My personal range of quality extends from 64kbps to 128. I prefer 128 because my ear is sensitive enough after years of podcasting to hear the difference however when necessary I’ll drop to 64kbps. My show Podcasters’ Roundtable is recorded at a much lower quality because we use Google Plus Hangouts On-Air to record which, at the time of this post, is still not high quality. I think the audio is around 64kbps or even lower. To send out a file that is compressed at a higher bit rate would be a waste of space since you cannot “up-res.” an audio file. So in those cases when the audio from Podcasters’ Roundtable is ripped from the video file, I send it out as 64kbps. In my day job as a professional podcast producer I work on shows that can go as long as an hour to two hours. When I consider our large international audience, many of whom may have bandwidth limits, I have to consider producing a file that is at 96 or 64kbps simply for size sake. The Podcasters’ Studio podcast is my flagship podcast and recorded at the best quality possible. I release this show at 128kbps when the episode doesn’t exceed 45 minutes to an hour because I love the way it sounds and the file is not so large that I get complaints from my audience. 2. How much space do I have in most hosting account? While the number of podcasts I produce has increased over the years, The Podcasters’ Studio, Podcast Quick Tips and Podcasters’ Roundtable, my hosting account at Libsyn has remained the same. As I mentioned above Podcasters’ Roundtable is produced at a lower bit rate and thus results in a smaller file size. Therefore I’m able to fit that show into the monthly space I’m allocated on my hosting account. But if you find yourself running out of space on your hosting account you may consider compressing your file at a smaller bit rate in order to save space. Going from 128 to 96kbps is a very acceptable compromise for me. Give it a shot and see if you notice enough of a difference to make a difference. 3. How big is too big in relation to the length of the podcast episode? As I said in point 1. if I have an episode that goes over an hour it’s time to consider producing a file that will result in a smaller total file size. Podcasting is a global venture and it’s important to consider your listeners in other countries who might not enjoy the limitless bandwidth you get. Another consideration is simply the amount of time it might take to download your file. I’ve stopped listening to more than one podcast because the file size was so enormous that it would take way too long to download. In this day and age of wifi and smartphone streaming, long download times aren’t as much a factor but it’s still nice to have the download completed for when you enter dead zones or are planning to travel by plane etc. If you’re producing a podcast that exceeds 45 minutes to an hour, take a serious look at the size of your file and consider your audience. I release my final audio file into various formats within the limits described above based on the factors I’ve outlined. The choice is a personal one between you, your audience and your budget. Hopefully these factors and guidelines will help you determine what size and quality is best for your show.